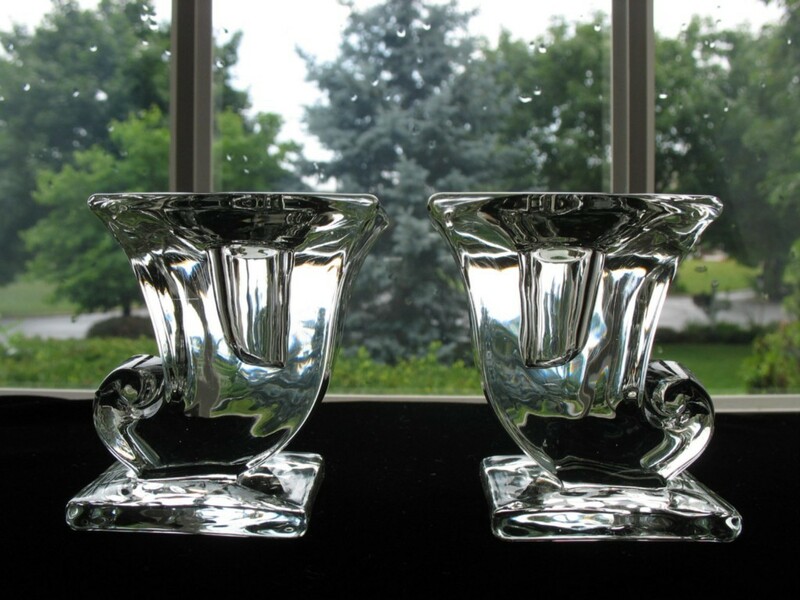 New Martinsville Deco Cornucopia Candleholders Offered for sale are a pair of attractive mid-century design Cornucopia candleholders with a contemporary flair, exquisite for any decor and fabulous for autumn! These were made by the New Martinsville Glass Co. as their #652, produced from 1942 - the early 1950's. Each candlestick measures 2 3/4" high at the top. The rectangular base measures 2 1/4" by 2 3/8". Each candle stick is in excellent condition, no chips, nicks, cracks or discolorations. There are a few very minor surface scratches on the base. PAYMENT IS DUE WITHIN 5 DAYS. Please let me know if there is any problem. I understand that things happen, get over-looked, etc. All I ask is that you contact me and I will be happy to work with you. I will always send a payment reminder first. Please note: If paying by e-check, Paypal requires approx. 1 week for clearance, international payments take two weeks. Kindly keep this in mind. Buyer pays actual shipping charges plus a small handling charge. Shipping Insurance coverage is provided for all items. I use quality shipping materials in generous quantity (bubble wrap, packing peanuts, etc.) I also buy most of my boxes as the priority mail boxes are not adequate for 90% of the items I sell. I weigh each item (s) prior to listing and I am as accurate as possible in my estimate. When the item(s) is actually packed, it is possible that there may be a slight difference. If I over estimate resulting in an over charge of shipping cost, I will gladly refund the difference if over 1.00 (excluding the handling charge). If I under estimate, it's on me. If I miss this, please let me know! You may also notice a small differnce in the amount of postage shown on the label. This is due to a small discount the post gives for commercial based pricing. I am happy to combine shipment of multiple items if safe to ship together. Canadian bidders welcome. International bidders considered on an individual basis. Payment must be made in U. S. Currency. Please contact me for information and shipping quote. I keep my start price as low as possible, well below the prices listed in reference books! Every effort is made to disclose obvious flaws or damage and to provide accurate information in the description. Unless stated otherwise, almost all of the glass and china, ceramics, etc. I sell is vintage and in used condition. Evidence of use such as surface scratches and manufacturing occurrences such as straw marks, bubbles, rough seams, ripples and mould marks are usually evident in this type of glass. With china and ceramics, there may be some crazing of the glaze due to the aging process. Please assume that the items will contain some or all of these. I do not make a point of mentioning normal wear or every manufacturing flaw unless it is really noticeable and detracts from the appearance. Since you may view this differently, please make sure you ask questions before you bid. I am happy to provide all of the information I can. I clean all items, but do not attempt to make any repairs. You receive the item as it was purchased by me. If you have any questions, please email me prior to making a bid. A word about measurements. I do my best to provide accurate measurements, but it can be difficult with certain types of pieces. Measurements will be accurate to within 1/8". Width measurements are outside measurements unless handles are involved, then both measurements are given. I have a library of reference books and make every effort to provide correct information regarding pattern name, manufacturer and date of production. I welcome any information regarding correction of or addition to the information I have provided. Please contact me with any questions at allthatglass@rcn.com.